Will Great Nutrition Guarantee Trophy Bucks? If only it were that simple! 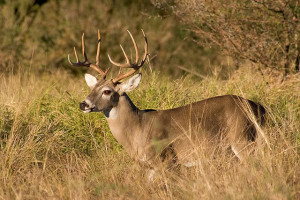 Great nutrition will give your deer the opportunity to maximize their genetic potential for antler growth, but it is just one (albeit an important one) of many factors that affect deer antler growth. Even assuming that you are providing the best nutrition possible, other things, some within your control and some not, will affect production of trophy racks. General health greatly influences a variety of factors that affect deer antler growth, such as feed intake and hormone production. If your deer are laboring under a parasite load (internal or external), clinical or sub-clinical disease challenges, or have been injured, antler growth will be negatively affected no matter how nutritious the feed because nutrition will be siphoned off to deal with these other issues. Good management must go hand-in-hand with nutrition to get optimum results. Environmental conditions are also a factor. Climate can affect how much time a deer spends eating, moving around, resting, etc., and how much energy it expends just staying warm or cooling down. Stressors such as traffic or roaming dogs can upset deer, raising blood levels of the stress hormone cortisol and negatively impacting feeding behavior and nutrient usage. Even something like an improper feeder design can affect how much a deer will eat. Water availability is critical. Research has shown that in many species of ruminants, if water intake is reduced even minimally, food intake drops also. Water must be fresh, clean, available, and away from stressors that might inhibit a deer’s water intake. Maximizing water intake will help maximize feed intake. Genetics, of course, are very important. If a buck is genetically programmed to be average, then the best feed in the world will make him only average. Keep in mind, however, that a lesser feed will allow him to be only less than average. However, a buck genetically programmed to have a superior rack will not achieve that growth without optimal nutritional support. If you want your bucks to achieve their genetic potential, then you must feed them accordingly. Finally, there are population factors that can affect deer antler growth, primarily population density (how many animals are in a given space) and dominance relationships between bucks. Even mild crowding is a stressor that affects hormone levels, impacts feeding behavior, and leads to increased energy expenditure and even injuries due to increased movement and numbers of altercations. Bucks must be managed with their social hierarchy in mind if injuries are to be minimized and desired breeding strategies achieved. All in all, while nutrition is extremely important, and great trophy racks will not be achieved without optimal nutrition, management and genetics are also critical to achieving superior antler growth. Stop by Lochte Feed and General Store for all your wildlife feed & Supplement needs. We carry Purina Antlermax and other supplement feeding programs. This entry was posted on Tuesday, May 10th, 2016 at 10:31 am	and is filed under News & Updates. You can follow any responses to this entry through the RSS 2.0 feed. Both comments and pings are currently closed.